There are many different types and brands of contact lenses. Drs. Jacob, Anderson, Wang, Minhas, Kirak, Guajardo, Griffiths or Lopez can help you determine which type of contact lens is right for you. The most common option for contact lens-patients is soft contact lenses. These lenses are made of hydrophilic or “water-loving” polymer. The oxygen-permeable soft lenses allow for comfortable extended periods of wear. Their comfortability combined with their ability to provide clear, stable vision makes soft contact lenses the popular choice. However, soft contact lens do not correct all vision problems, the vision obtained from them is not as sharp as with other lenses, and they tend to soil easily, and therefore need to be replaced more often. Another option is the rigid gas permeable (RGP) contact lens. These contacts are made from rigid waterless polymer, and are oxygen permeable. RGPs transmit more oxygen to the eye than soft contact lenses, and therefore promote good ocular health. RGPs are generally prescribed to patients with irregular ocular surfaces, astigmatism not corrected by soft lenses, and to those patients who require a multifocal or bifocal lenses. They are longer lasting, easier to clean, and usually provided better vision than soft lenses. However, RGPs tend to slip off the center of the eye more easily, tend to collect debris under them more than soft lenses, and must be worn consistently at length to promote adaptation. Cosmetic contact lenses are lenses designed to alter the appearance of the eye. They may or may not also provide corrected vision. One type of cosmetic lenses aims to “change” the color of the eye by providing a tinted color to the lens, that when placed on the cornea gives the appearance of the desired color. Another type of cosmetic lens aims to give the appearance of an enlarged iris. Cosmetic lenses generally cause eye irritation when first introduced to the eye, but once adaptation occurs, irritation usually subsides. 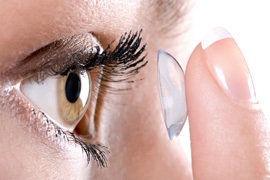 Unlike glasses, which tend to interfere with sports and exercise, contact lenses do not. This allows you more freedom to engage in any activity you want without worrying about your vision. Contact lenses generally offer better improved sight than glasses. For patients concerned with physical appearance, or the social stigma of wearing glasses, contact lenses offer an invisible option for improving vision. One of the main disadvantages of choosing contacts is that unlike glasses, contacts require consistent care. Each night, contacts must be removed from the eye, cleaned in approved solution, and placed in their airtight container. The container must be replaced every 3-6 months, and kept dry when not in use. Failure to adhere to proper cleaning procedures could lead to infection. The risk of infection is another disadvantage of contact use. Excessive wear of the lenses, particularly overnight wear, is associated with many safety concerns, and could lead to infections in the eyelid, conjunctiva, and cornea. Bacterial infection resulting from improper cleaning of lenses should also be a considered risk. Be sure Drs. Jacob, Anderson, Wang, Minhas, Kirak, Guajardo, Griffiths or Lopez reviews proper care for your contacts at the time of your appointment.